Transforming your IT environment demands a new architectural approach known as “Composable Infrastructure,” where the infrastructure framework is composed of all the physical resources (compute, storage, and network fabric), treated as services and managed using a unified API that allows your IT infrastructure to become agile and flexible to fully support the idea economy. In the past, the CFO has had a reputation for being more of an obstacle to IT than anything else. Investments in IT never seemed to top their list of priorities. These days, financial leaders are beginning to recognize the revenue-generating potential of IT, especially when assessing the idea economy potential of delivering ROI. That, combined with the fact that businesses are more collaborative these days (thanks to technology), allows more members of the IT organization to take ownership in achieving business goals. In the current environment, it is important for IT and finance leaders to fully understand each other, to “speak the same language,” so they can make the best decisions for the success of the business. The following are a few of the myths surrounding financial aspects of composable infrastructure that, when debunked, can help make the value proposition for CFOs much easier to picture and show them how this upgrade could put IT in the plus column for a change, preparing the ground for develop idea economy in their organizations. The CFO just wants to cut costs and limit IT spending. Not true. The purpose of the CFO is to invest wisely for business growth, not just cut costs. No business ever became great just by cutting costs. When discussing the cost of a composable infrastructure solution with the CFO, emphasize the value of the solution in terms of reaching their business goals and how it will yield value. Never forget—CFOs love ROI. Opex is better than capex. Both capital expenses (capex) and operating expenses (opex) have their place in IT budgets. But when building your case for a composable infrastructure solution for the CFO, don’t focus on capex and opex. Instead, discuss how the composable infrastructure model delivers the greatest value over the long term. Leasing is preferable to ownership from a cash flow perspective. Budget-friendly monthly lease payments might seem like the only way to achieve infrastructure goals, but there are a lot of new, innovative ways to finance solutions without huge cash outlays up front. This includes the possibility of aligning costs for premises-based equipment with capacity usage. Talk to your CFO about cash flow needs and talk with your IT solutions provider to help present alternative financing options. Everything is moving to the cloud, so there’s no point investing in the data center. Your data center is not a short-term solution. In a hybrid IT, composable infrastructure environment, the data center will be an important part of your IT infrastructure for a very long time. Before talking to your CFO, first calculate and compare costs for optimal workload delivery across a range of deployment options and environments, including on-premises and hosted; public, private, and hybrid cloud; physical and virtual; commercial and homegrown. The public cloud is always the cheapest option for running a workload. If you assume the cloud is the only way to go, you will end up paying more than you should for cloud services. Steady-state production workloads represent a lower total cost of ownership (TCO) when run on an efficient, next-generation infrastructure in an on-premises data center than it does in the public cloud, where users have little visibility or control of the infrastructure. When talking to your CFO, reference the previous calculations. The public cloud eliminates management and administrative costs. Many IT organizations that moved workloads to the public cloud with the expectation of reducing labor costs are experiencing sticker shock. When assessing a public cloud option, be sure to factor in the full management burden. When talking to your CFO, focus on infrastructure solutions that minimize management effort (and costs) across hybrid IT environments, as well as the flexible deployment of IT staff to maintain an optimal infrastructure. Emphasize the value of the solution in terms of reaching business goals and how it will yield value. Idea economy sustained by ROI is a good way to go. Focus on how the composable infrastructure model delivers the greatest value over the long term. Calculate and compare costs for optimal workload delivery across a range of deployment options and environments. Compare if production workloads represent a lower total cost of ownership (TCO) when run in an on-premises data center rather than in the public cloud. Focus on infrastructure solutions that minimize management effort (and costs) across hybrid IT environments, as well as flexible deployments of IT staff to maintain an optimal infrastructure. 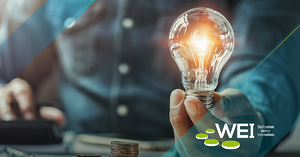 Better yet -- share this WEI case study with your CFO that highlights how implementing HPE Synergy resulted in over $1M cost savings for this WEI customer. 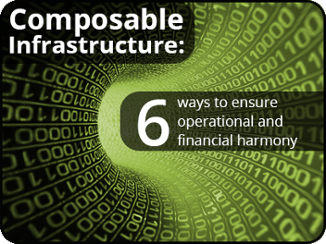 NEXT STEPS: Learn more about Composable Infrastructure and how to maximize the investment in this next generation data center solution in our white paper, Orchestrating Composable Infrastructure: 6 Ways to Ensure Operational and Financial Harmony. Shane Garrett is Vice President of Sales at WEI. As a seasoned IT sales executive, Shane drives the strategic direction for account management, business development and marketing at WEI. His experience in cloud computing and IT automation solutions and services coupled with his ability to build customer-centric sales teams has been a key aspect of his success at WEI. Shane has been with the company for over 13 years and takes pride in developing long lasting client relationships built on trust.